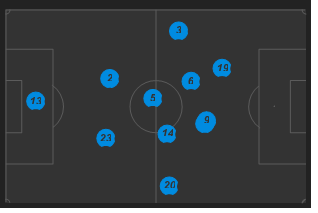 As people are still insisting that Costa played as a winger last season (in reply to my article of this morning – http://statsbomb.com/2013/08/diego-costa-dissected/) I took 5 minutes and copied a few screen shots of his average position in 4 games that I quickly selected. Now, I’m not claiming that he played as central as shown in all of his games, but it’s wrong of people to claim that he played as a winger. Costa is number 19 in these images. Apart from being central he is also the most forward Atletico player in each of these 4 matches. If a player that far forward is not there to shoot at goal, he’s probably taking the position of someone who would. Even in that match I feel it would be wrong to classify him as a winger. He is still fairly central and once again, look at how far forward he is.